#DEEPtalk Mealtime Event, Copenhagen 2018 | Life, Sport and Diabetes - An everyday look at my life with type 1 diabetes. This week I had the incredible privilege of presenting at the Novo Nordisk DEEP (disease experience expert panel) talk Mealtime event in Copenhagen, Denmark. The event was held at Novo Nordisk HQ, located just outside the city centre and brought together people with diabetes from all around the globe, Novo Nordisk employees and was live streamed across the world (which can be viewed here if you missed it). The event was incredibly innovative in the way it brought people with a breadth of diabetes experiences together, to show that whilst a challenge sometimes, an empowered life with diabetes is possible. That to quote a fellow d-blogger and friend, Phyllisa- diagnosis does not have to mean defeat with diabetes. 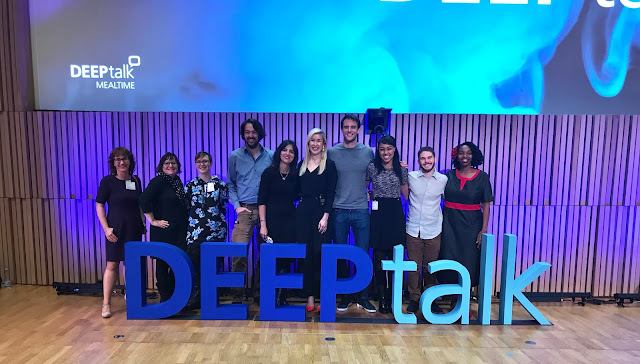 The DEEP talk event consisted of 9 speakers, who represented a truly international diabetes community. But whilst we all spoke different languages, we all spoke the same language of diabetes and it was fascinating to hear about the variation of experiences of living with the condition from around the world. The event was facilitated by diabetes advocate from Australia Renza Scibilia, who kicked us off by introducing our first speaker -Phyllisa Deroze. Originally from the USA, Phyllisa spoke about strategies for navigating festive food during the holiday season when living with type 2 diabetes. Next up, second speaker Antje Thiel from Germany, shared her thoughts on the many things that can impact our diabetes, from emotions to exercise, feelings to food. Paul-Louis from France then told his fascinating story of travelling with type 1 and what he did when he found himself hypo on a desert island. The first half of the event was then concluded by Leighann and daughter Quinn from America, who shared their experience and tips of managing type 1 diabetes at parties, sleepovers and school, with great humour and honesty. The second half of the DEEP talk event was opened by Bruno Helman from Brazil, who told his story of choosing to follow a vegan diet with type 1 diabetes. Then, Sara Mobeck from Sweden showed incredible bravery in telling her story about her recovery journey from having an eating disorder, with type 1 diabetes. 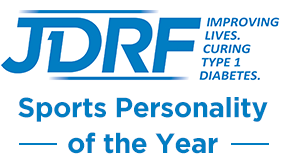 Next up it was my turn, as I represented Great Britain to speak about my experience of balancing type 1 diabetes with carb-loading for optimal performance in sport, and overcoming hurdles to succeed with it. I talked about the idea of thinking 'BIG' about diabetes and sport. I,e- Blood glucose levels and what they're doing, Insulin and whether insulin on board might cause a hypo or a high and Glucose- carrying it with you. Then last, but by no means least, Bastian Hauck from Germany talked about the burden of diabetes management in a practical and relatable way, highlighting just how much we do and think about, in relation to managing our condition on a daily basis. Then all too soon the event was over, but what an incredible event it was. With the kindest of feedback from the audience who had been watching and interacting online. Which I think reflected the very nature of the diabetes online community- that we're all in different locations, managing our diabetes in different ways, but we're there for each other through the power of social media, connecting us and enabling us to share experiences, offer support, encouragement and empowerment for the highs and lows of managing the condition. With thanks to Novo Nordisk for kindly sponsored me to attend this excellent event. All thoughts and views are my own.